As teachers continued picketing at Los Angeles-area schools, contract negotiators for the teachers’ union and the Los Angeles Unified School District returned to the bargaining table Thursday to discuss the potential for a resolution of the four-day-old strike. But despite United Teachers Los Angeles and the LAUSD resuming contract talks, there was no immediate indication that a deal was imminent. Union president Alex Caputo-Pearl suggested the talks were likely to stretch at least into the weekend. Caputo-Pearl said the striking teachers are already planning another large rally at Grand Park next to City Hall on Friday. Thousands of UTLA members rallied at the park on Monday, the first day of the strike, before marching through downtown to LAUSD headquarters. “That rally tomorrow has to be absolutely massive to send our bargaining team into the weekend with a huge piece of wind in their sails and momentum with them,” Caputo-Pearl said. UTLA and LAUSD negotiators met behind closed doors beginning at noon at City Hall. Mayor Eric Garcetti helped lure the warring sides to the table, with an assist from state Superintendent of Public Instruction Tony Thurmond. “I am certain that together we will get (through) this and we will get our kids back to school,” Thurmond said earlier. The last negotiating session was held Friday, when the union rejected the district’s latest contract offer. The teachers went on strike on Monday, calling for increased pay, smaller class sizes and the hiring of more support staff, such as nurses, counselors and librarians. 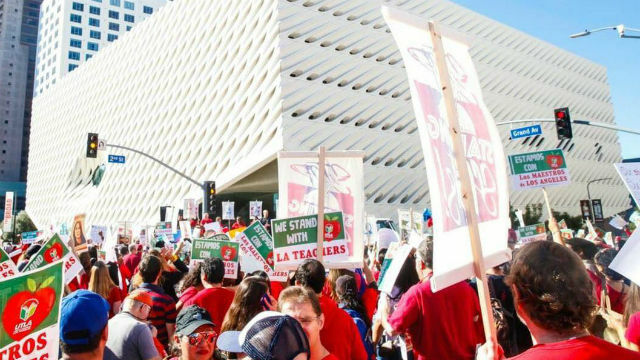 LAUSD Superintendent Austin Beutner said Tuesday the district has offered the union as much as it can given its financial constraints. He said the union’s demands would cost billions of dollars and bankrupt a district already teetering on insolvency. According to the LAUSD, at least 132,411 strike-affected students went to class Wednesday. That figure was a 22 percent drop from Tuesday’s revised attendance figure of 171,480. On Monday, the first day of the strike, 156,774 students went to class. District officials said the absentee rate translated to a gross revenue loss of about $69 million in state funding, which is based on daily attendance. The loss is partially offset — by roughly $10 million a day — due to salaries that aren’t being paid to the striking teachers. Beutner estimated earlier this week that the district suffered a net loss of roughly $15 million on Monday alone.